End the guilt! Reasons I like boxed cereals. Home » Father » End the guilt! Reasons I like boxed cereals. Breakfast is a key meal of the day, both for kids and adults. Literally, the meal that breaks the long nightly fast, it’s not a good idea to skip this meal to go hungry until lunch. This is particularly true for kids who need a good breakfast so they have the energy to work through what is usually the longer part of the school day. In fact, a variety of studies show that kids do better at school if they eat breakfast. One study showed that kids who ate a healthy breakfast had higher learning ability than other students who did not eat breakfast. Another Harvard study in 1998 among students in Baltimore and Philadelphia showed that students who had breakfast had better math scores, were more attentive, and had fewer behavior problems. While some have quibbled with these studies and whether they adequately controlled for other factors, it would seem that the science would only back up what is obvious: You need to have food in your belly to perform best at whatever it is you’re doing. 1. They are fast, and even at an early age, like 6 or 7, kids can serve themselves. This is particularly valuable if you have multiple kids. I’d never advocate McDonald’s just because it gets the job done, but cereals can be a convenient and healthy morning option. 2. Cereals are a great way to get two more food groups into the mix: milk and fruit. Kids don’t get enough milk these days since most school milk programs have been eliminated. They need calcium and vitamin D. Kids should get 3-4 servings of milk per day. If you serve milk in the cereal and calcium-fortified OJ with breakfast, you’re already halfway to their daily needs. Additionally, cereal is a great time to get some fruit into their stomachs. Most kids won’t complain if you add a banana or some berries, both excellent choices for natural sugars. Again, since the daily suggested amount of fruits and vegetables for kids and adults is 3 cups, serving some fruit and some orange juice at breakfast is already a great start to the day. 3. We are all missing whole grains in our diets. We snack on bad stuff, eat lots of white flour and can never figure out whether “whole wheat” is the same as “whole grain” or simply stuff marked “wheat flour.” Breakfast can be an opportunity to get whole grains in our diet. Cheerios – a perennial favorite that has very little added sugar (1g per serving) and is made of oats. No, it’s not oatmeal, but does have 3g of fiber. I wish it had a little less sodium, though at 280mg. Uncle Sam toasted whole wheat flakes and flaxseed. You’re in luck if you can get the kids to eat this cereal. It has 10g of fiber, which goes a long way to the total recommended amount of 25g for an adult. Some say it tastes like cardboard, but with some added fruit, it’s pretty good, and all natural. 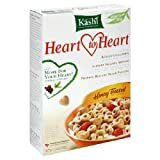 Kashi makes some very good cereals, including their Heart-to-Heart cereal using whole grains. Like a lot of the cereals, they do have added sugar, but in small quantities. this is okay. Organic Path also makes cereals that are low in sodium and high in Omega-3s. Look at cereal boxes, trying to increase the amount of fiber (both soluble and insoluble) while avoiding added sugars and corn syrup and you should be able to serve a fast and healthy breakfast to your active family, or maybe even get them to serve it themselves. Save the big and healthy breakfast for the weekend, when you might have time to make healthier versions of pancakes, fruit and yogurt parfaits, and fresh unprocessed meats (sorry, no bacon except for special occasions). 1 Crockett, S., & Sims, L. (1995). Environmental influences on children’s eating. Journal of Nutrition Education, 27, 235-245.